Alyssa Wilmoth and Stephen Lorne Williams in RICHARD II. Photo by TOMMY THOMPSON. 2008. 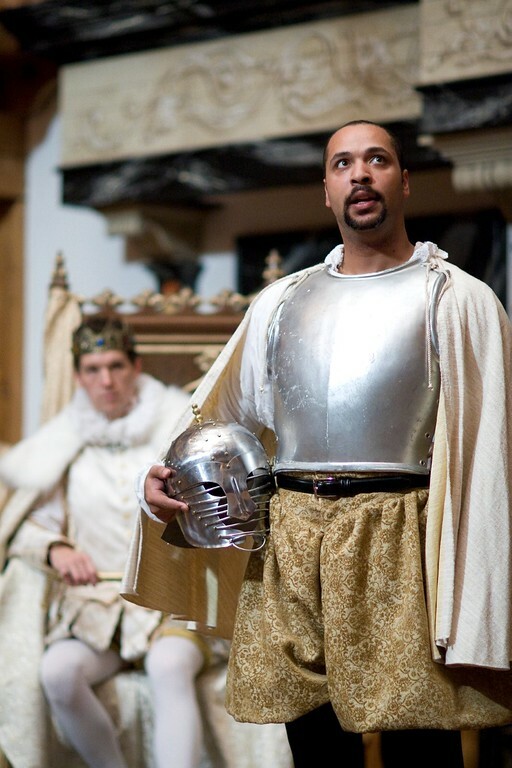 John Harrell and René Thornton, Jr. in RICHARD II. Photo by TOMMY THOMPSON. 2008. 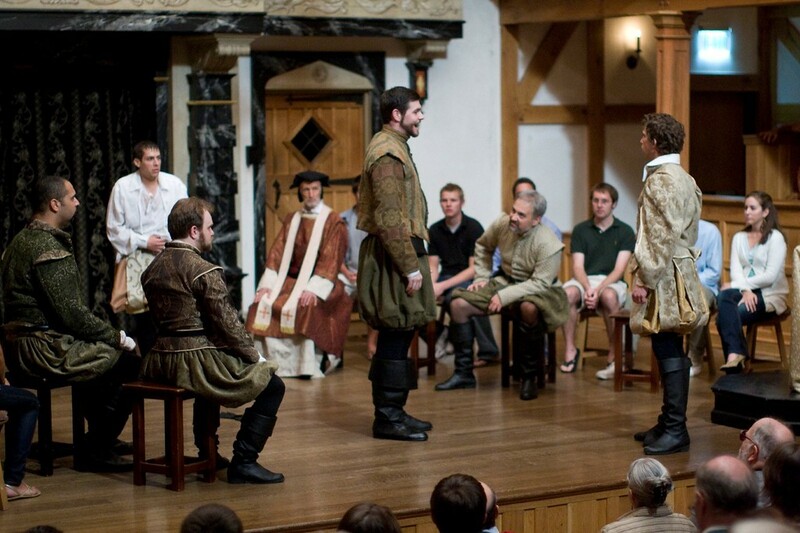 John Pasha, John Harrell, and René Thornton, Jr. in RICHARD II. Photo by TOMMY THOMPSON. 2008. 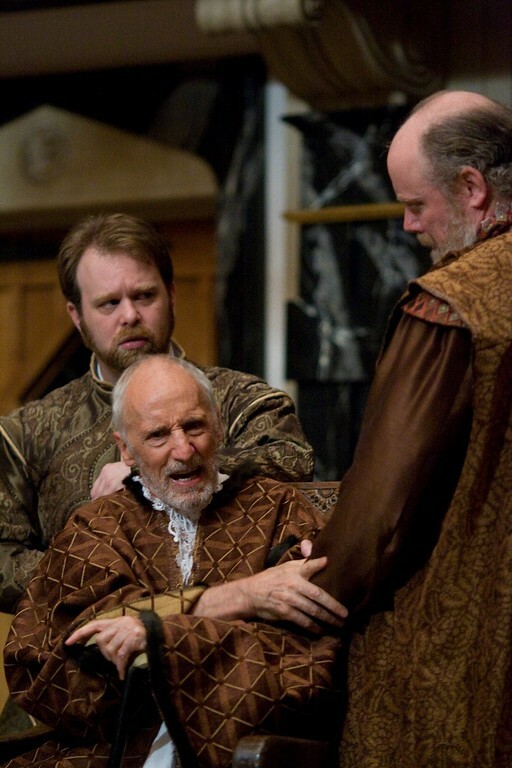 Sasha Olinick, Stephen Lorne Williams, and James Keegan in RICHARD II. Photo by TOMMY THOMPSON. 2008. The cast of RICHARD II. Photo by TOMMY THOMPSON. 2008. 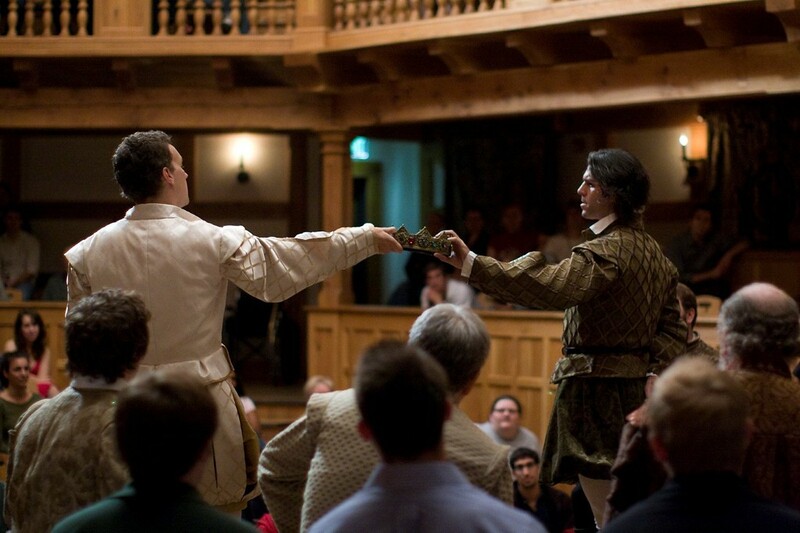 John Harrell and John Pasha in RICHARD II. Photo by TOMMY THOMPSON. 2008. 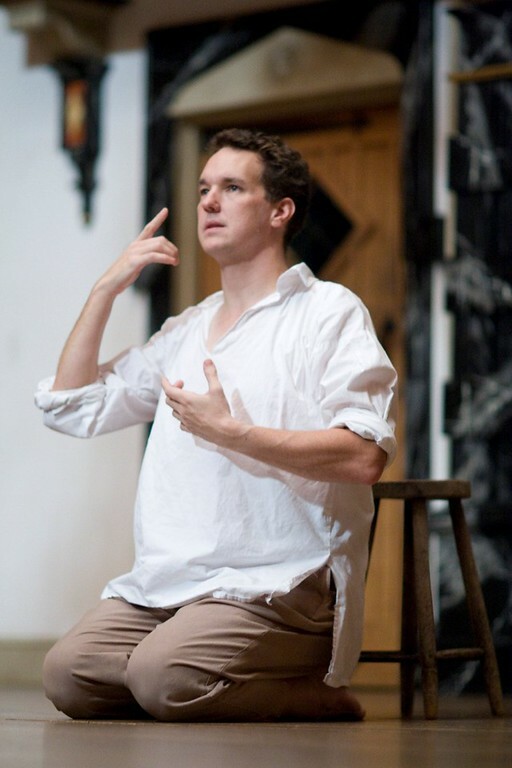 John Harrell in RICHARD II. Photo by TOMMY THOMPSON. 2008. 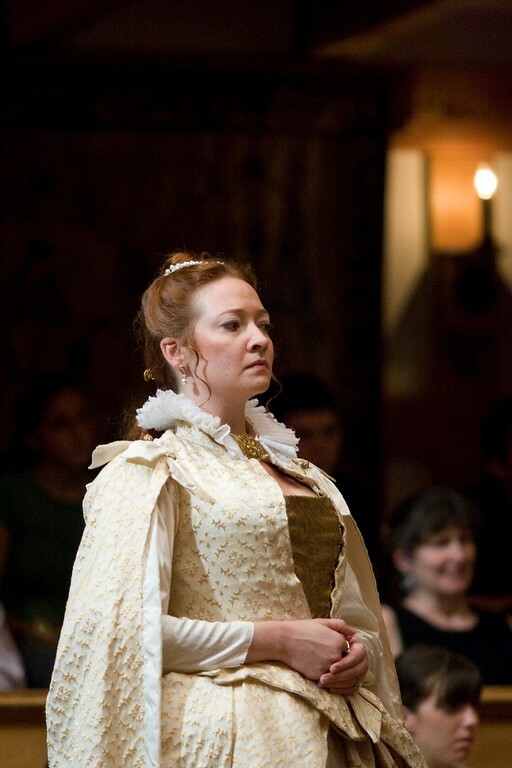 Sarah Fallon in RICHARD II. Photo by TOMMY THOMPSON. 2008. 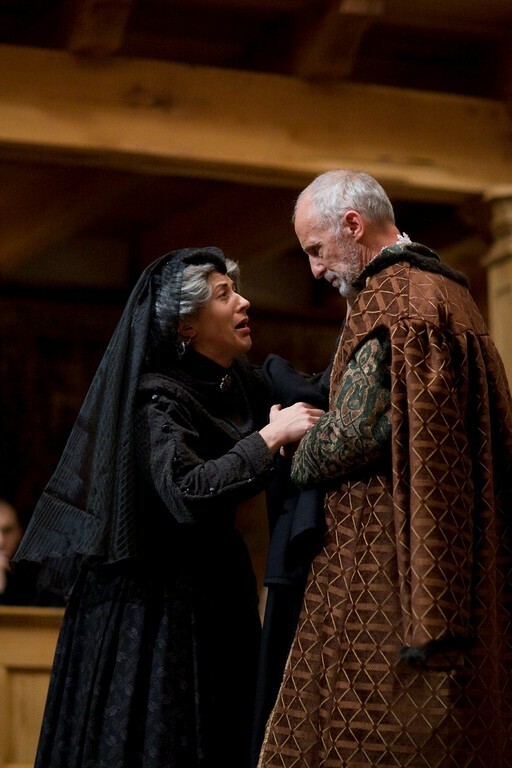 Allison Glenzer and Gregory Jon Phelps in RICHARD II. Photo by TOMMY THOMPSON. 2008. The glory and the great failing of King Richard II in Shakespeare’s play is that he lives entirely in his language. Richard uses language to make a world, to create and recreate his own story; until his death, he translates everything that happens – even his deposition – into the “Poem of Richard.” The result is a play at odds with competing realities. The play opens with the promise of an exciting physical contest – a jousting match to the death between Mowbray and Bullingbrook. That is the story that wants to be told, and the story than an audience expects to see, but it is not Richard’s story, so – though the death of either of the contestants would be to his benefit – Richard co-opts the moment and banishes the two men, stealing the big scene from them and from the audience. Shakespeare’s genius makes us glad Richard steals the scene. 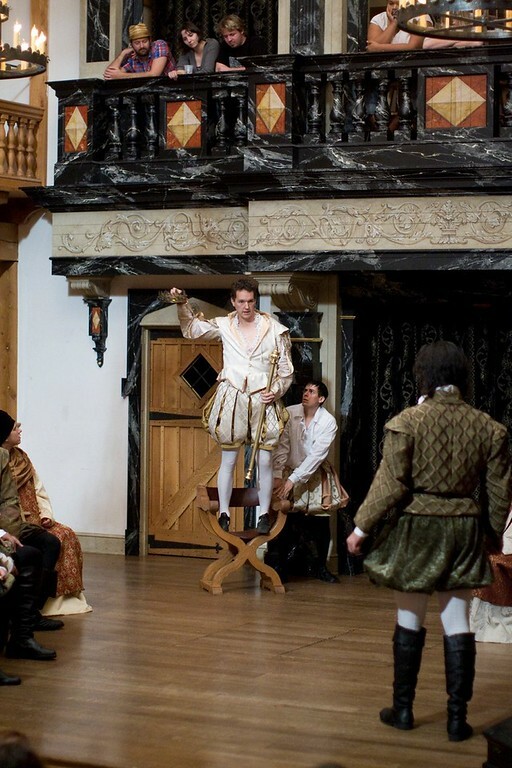 This penchant for stealing the scene may explain one of the oddest things about this play and the central event, the usurpation of the English throne by Henry Bullingbrook. In Shakespeare’s play Bullingbrook never actually takes the crown; Richard’s poetry gives it to him. 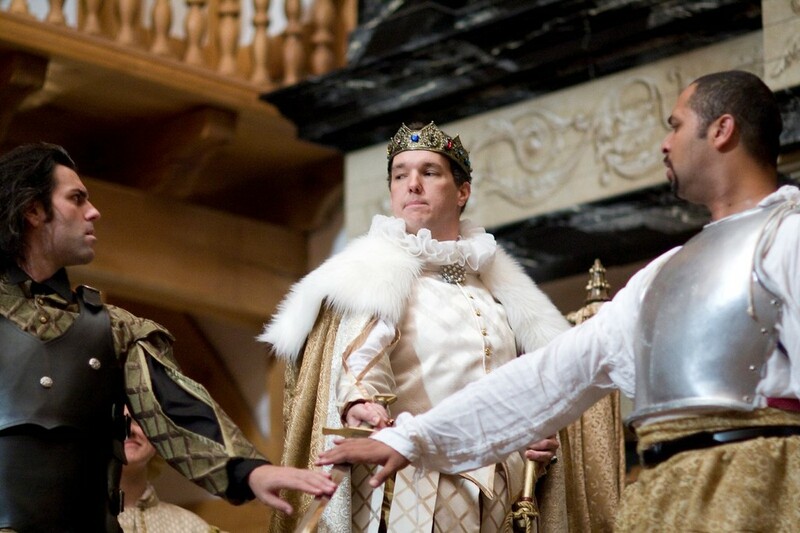 Richard is the one who makes the usurpation inevitable by assuming the worst – “Your own is yours, and I am yours, and all” – and stage-manages his own deposition (the event that prompted Queen Elizabeth I to say “I am Richard II”). Historically, the political reality of Bullingbrook’s victory certainly meant that Richard would lose the crown, but Shakespeare’s play mutes thatreality and shows us Richard giving the crown rather than Henry’s taking it. 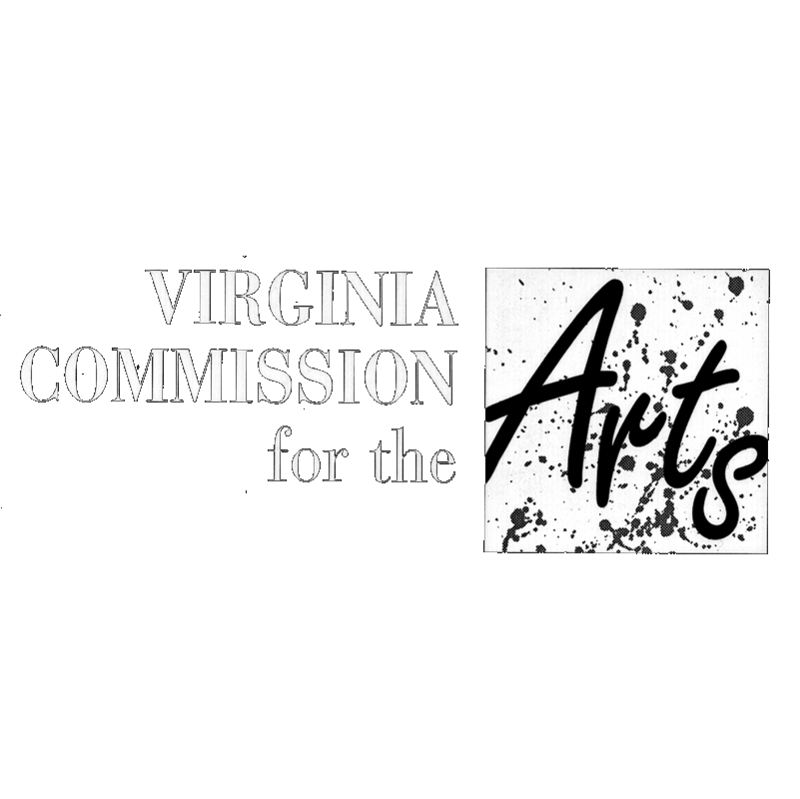 The scene, the act, the language, and the play are Richard’s. Even when he is a self-pitying drama queen, his language is rich and clear. The image is surprising and brilliant and over the top – too clever, too artificial, too surreal for us to trust the speaker. And when, later in the speech, he invites his lords to “sit upon the ground / And tell sad stories of the deaths of kings,” he confirms our sense of his having a “poor pitiful me” party.  here is a man coming to plainest terms with the limits of kingship; here is a man well on the way to his final wisdom: that “I…with nothing will be pleased till [I] be eased / with being nothing. Here, too, is a playwright who has begun the philosophical journey that will lead him to King Lear.